Apologies for the brief round-up this week, it was a bit of a rush job this morning. Thank you for the race reports, please keep sending them to helsby-race-reports@outlook.com if you wish for them to be included in the round-up each week. It was the season finale of the multi terrain race series on Tuesday. Great to see lots of green vests out and getting involved in this race series and nice to see a few new faces in the mix too. Neil Finegan has sent in a report from the final race at Arrowe Park. One of the best things about running for Helsby has been the introduction to some superb races that I’d never have considered (or heard of) before. 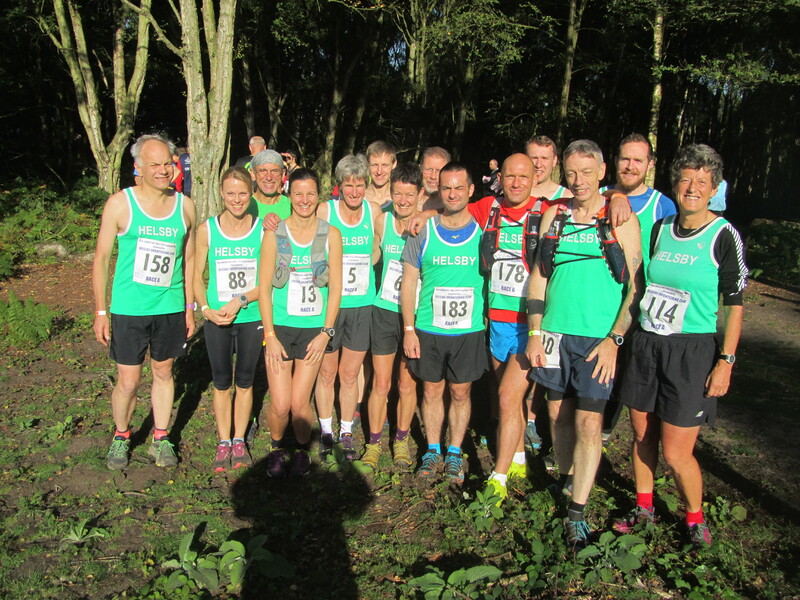 The Multi Terrain series (I’ve ran 3 of the 4 races) have all been superb – well organised, great atmosphere and all for £1 per race. And there was of course a big Helsby turnout. Last weeks event was the last of the series at Arrowe park and was again a real treat. Starting with a lap of the field it then went into a mixture of woodland trail, undulating grassed fields and just when you thought it was over – another lap. A great run, going from the open fields into the forest at dusk was a challenge, as was dealing with the crowds at the start. But the popularity of these events (all with over 300 runners) is understandable – They are top races and at a bargain price. One runner described it as a cross country course but without the mud which sounds about right. First Male for Helsby was Chris Collins and Jo Lacking was the first Helsby Lady home. Worth saying that the first three finishers get their ‘place’ prizes and not their age category prizes – this rule affects both Alison and Vanessa. Great to see lots of support from other Helsby members. Also this excellent report has been sent in by Jackie. Yesterday was a splendid Indian Summer day for the 39th Sandstone Trail Race. The A Race is 27.5km (17.1 miles) with 655m climb starting from Duckington and the B Race is 17.0km (10.6 miles) with 288m of climb starting from Beeston, both finishing at Barnesbridge in Delamere. A great turnout from Helsby with plenty making the journey south to Duckington for the long race. A crowded start up through the trees on a tranquil dewy morning and onto the open edge of Maiden Moor with misty clearing views out towards Wales. An ideal temperature for running (to start with before it got rather hot) and great under foot, dry but soft and bouncy! Onto Raw Head and then towards Tough Team Challenge territory and Beeston Castle. The quick ones get through before the B race starts giving a less hindered run through the many flat stiled fields (planted with a lot more giant sweet corn than in previous years) before finally reaching the double pull up to Rock Farm and Primrose Hill. Finally the diversion from the trail up the Yeld to avoid the main A road crossing, over the shoulder of Eddisbury Hill and the drop into familiar Delamere for the final push dodging the many early afternoon visitors. Well done to Helsby runner Geoff Shaw for organising a great well marshalled and signed race which takes some doing over 17 linear miles! Thanks to Mario for supplying the extra lucozade sport needy refreshments along the course and to Joe’s vocal cheers, plus a special mention to Helsby members who helped marshal. Congratulations to Vanessa, Alison, Andy and Tim for getting individual category prizes, see Tim’s report. PS Going by the times and positions there must have been many green vests jostling for positions! Steve and I were oblivious to all this bringing up the rear, me nursing a cold and Steve a hangover! What? A cycling race you ask? Well we don’t discriminate here at Helsby RC so anything on 2 wheels is good in our book. 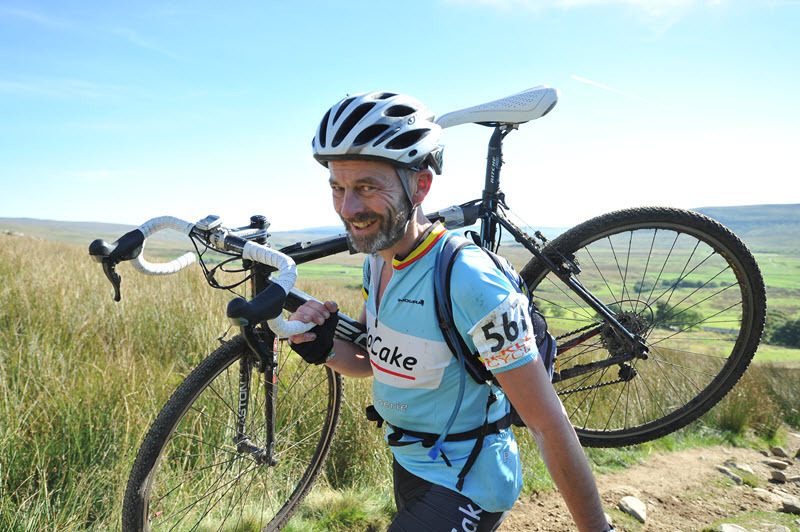 Steve Riley was at the 3 peaks cylco-cross on Sunday which is billed as the “toughest cyclocross in the world”. Sounds interesting and slightly bonkers, please read on for Steve’s take on the race. I’m not bragging or anything but would just like to mention ‘the hardest cyclocross race in the world’. For anyone not familiar with The Peaks, the race makes little sense. It makes little sense to those that are. It goes back to 1961, long before mountain bikes were a twinkle in the eye. Cyclocross bikes: they’re a bit like road bikes with chunkier tyres, slightly beefier frames and lower gears. They are an utterly unsuitable vehicle for travelling the slopes of Ingleborough, Whernside and Pen-y-ghent. In recent years runner Rob Jebb has made it his own, winning 11 of the last 16 events. 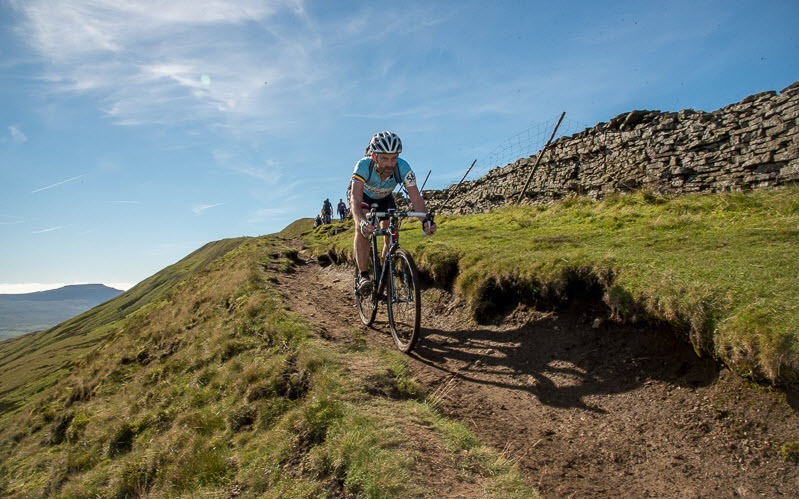 It’s a ride that suits fell runners – several of the elite of English champs were on the start-line, together with ex World Champ MTBer Tim Gould …and me. No fear of troubling the leader board, but it’s an absolute treat just to turn up and ride. I say ‘ride’ because there’s a lot of carrying. So anyways, Ingleborough is mostly a brutal and steep climb via Simon Fell, suited to knotty runner’s calfs, followed by a moorland traverse to the top. 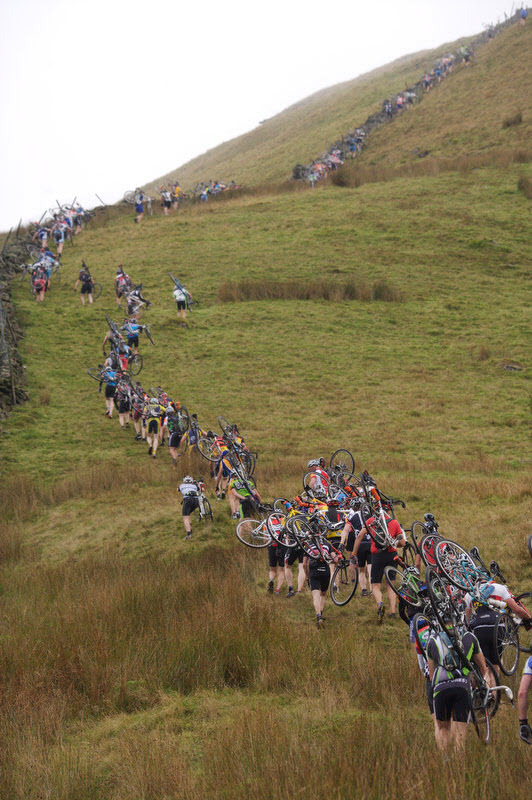 Dib in, turn around and after a tricky running section through the rocks to leave the summit and then a fast and rutted grassy descent (wrong bike) to Cold Cotes and the first of the road sections (wrong bike again) through to the next climb of Whernside. This is mostly rocky steps and the reverse of the descent on the fell race. Dib on the top and then the trickiest section of the whole race, down to the iconic Ribblehead viaduct familiar to all steam enthusiasts. Flags, drainage bars, rutted moorland tussocks and lots of rocks doing their best to attract punctures (wrong bike). More road down to Horton and the out and back climb of Pen-y-ghent. A bent rear mech by now making a nuisance of itself all the way down the road, the final hill taking a long time to draw close. Tired now and even the tiny road climbs are tempting cramp. Because this last hill is out and back you get the extra pleasure of seeing the fast folk flying down towards you as you’re suffering like a dog on the way up. Cowbells, whistles shouts of ‘rider up, keep left!’ raise your game …it was a lot quieter when I came down and the support had mostly gone home. Hit the road for the final couple of miles into the finish and both legs lock solid with cramp. Stretch, no that doesn’t work. Pedal, no that hurts. Soft pedal, sort of works. It passes and eventually, I’m back just sneaking under 5h for a pretty mediocre performance. Still, top 500 In The World! 38 miles (4 classed as unrideable, I’m asking for a recount) 5000′ of climbing. 2 litres, 4 gels, a 9-bar and half a squashed banana. An utterly, utterly unique event. Ed – Big contgrats Steve! Please find the results from the Satuday parkruns. Well done to all who took part. That’s all this week. Again, apologies for the lack of content this week, if I have missed anything please let me know and I can update the blog later on.